I'm a sucker for quiche, ever since my mom used to make homemade quiche when I was younger. So when Mom Central contacted me about doing a review and giveaway for Nancy's Appetizers, I knew that I would love to try their quiche. I had a hard time finding Nancy's Appetizers - all of my local stores didn't carry the amount that I had the coupon for (12 ct.) but I finally found it at my local ShopRite. 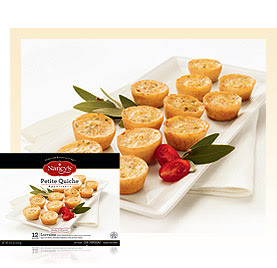 I got the Petite Quiche - 12 ct - and if you've never tried quiche, you are sure missing out! Quiche is basically an egg pie, this version contains Swiss cheese and savory bacon with fresh milk, eggs, onions, and chives, delicately baked in a rich buttery pastry. It's so scrumptious! Nancy's also offers entrees and desserts, and they all look great! See their product page for more info on their products! One of you will win a coupon for a free product from Nancy's Appetizers! For extra entries, please see my Giveaway Rules, updated 12/2/09. Fine print: This giveaway will end at midnight on 12/10/09. Winner will be announced here at A Simple Kinda Life and will be emailed. Winner will have 48 hours to respond to my email or will forfeit their prize. I wrote this review while participating in a blog tour campaign by Mom Central on behalf of Nancy’s Appetizers and received 2 coupons to facilitate my review and a $20 thank-you gift certificate. Disclaimer: I was sent a coupon for the product named above to review. The opinions expressed above are solely my own and yours may differ. Receiving a product will NEVER influence what I write in any review. um - chocolate petite tarts - yummy!! I entered the tea giveaway. I would try the quiche florentine. Nancy's Deli Wraps would be the perfect additon to our holiday buffet! I'd like to try Cheese Souffles. I am a cheese lover so the Cheese Souffles for me!! Subscribe to my blog via email and RSS feed. I'd like to try the deli spirals.